Cape Town is a surfer's paradise with hundreds of good surfing spots to be visited. A good start to a surfers day is to listen to the surf report by one of Cape Town's older surfers Deon Bing . His surf reports are normally very humerous and after a couple of his jokes and a bit of leg pulling of the disc jockey he normally forgets about the report. Mostly the waves are three to for feet on the Atlantic coastline and depending on the wind you are sent to certain beaches. Cape Town is dominated by two winds, the south easter in summer and the north west in winter. The latter is the rain wind and bringer of bad weather to Cape Town. When the south easter blows surfing spots on the Atlantic coastline come alive while those on the False Bay side die depending on the strength of the wind. The reason for this is that south easter is an offshore wind on the Atlantic coastline and blows against the oncoming wave causing them to be bigger and better. This wind also cleans up the surf turning choppy water into nice clean waves that are good for surfing on. On the False bay coastline it just flattens any waves that might be around. Depending on the direction of the wind this spot lends itself to all three of these disciplines. 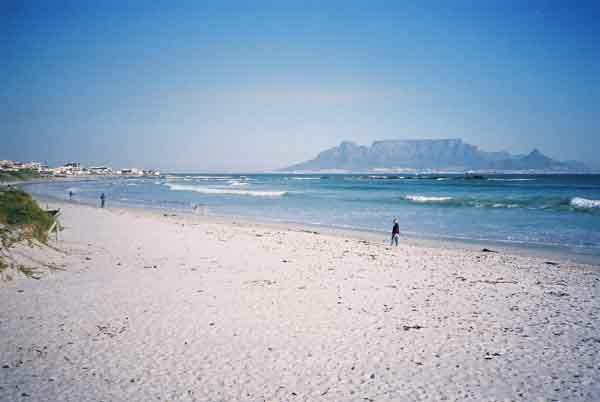 Further south down the Table bay coastline are the Table View, and Milnerton surf spots. These spots are very similar to each other and are also effected by the wind and are easily accessible with car parks situated along the beaches. This stretch of coastline with its lovely white sandy beach stretches all the way from Bloubergstrand to the harbour in Cape Town and is surfable along its whole length. On the western side of Table bay along the Greenpoint coastline are a number of good spots as well. They do not work if the south easter is blowing as the wind is onshore and tends to flatten the waves a bit. The coastline is also very rocky here so the surfer who chooses to surf here has to know his stuff otherwise he could end up on the rocks with a couple of extra holes in his head. Moving out of Table Bay we go southwards along the Atlantic coastline of the Cape Peninsula. Here the swells come in from the deep sea and break onto either the rocky coastline or into the few sandy bays which occur . 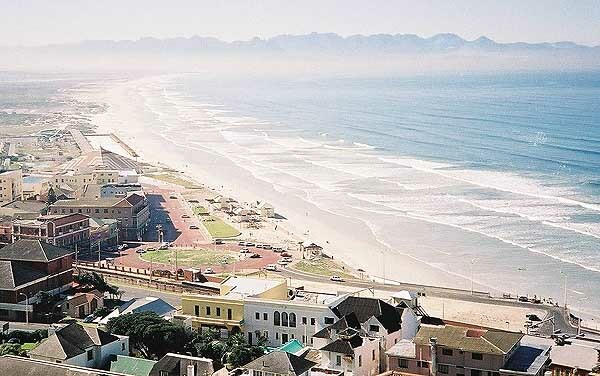 The names of the surf spots along this coastline are Sollys, Queens, Glen beach, Camps Bay ,Sandy Bay, Llandudno. Those who venture into the sea along this coastline normally wear a wet suit as the Atlantic water is icy cold around 8 or 9 degrees celsius. Travelling further south we arrive in Hout Bay where there is a spot off the Sentinel where brave surfers from all over the world come to surf. It only works in the winter months and is known for its very large waves. It is called Dungeons and can only be reached by boat. When the Red Bull competition is held at this spot waves have to be higher than a three storey building for the competition to run. Can you imagine falling off your board and having one of them break over you? From Hout Bay we move onto Noordhoek beach. 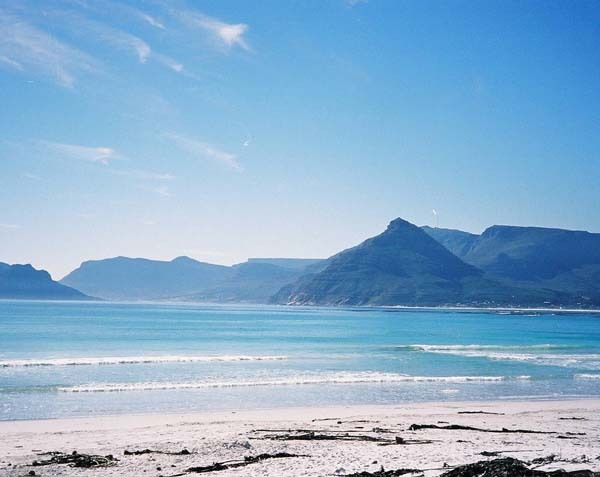 One of the longest beaches on the Cape Peninsula. There are a number of places to surf along this beach with the best known being Long Beach in Kommetjie. The corner at the bottom of Chapman's Peak has a shark spotter as a number of shark attacks have occurred in the area. When the south easter blows this place really works and the waves are really good. I grew up in Kommetjie and often did lilo surfing in the waves at Long beach. We called the waves dumpers as we often got caught in the curl and got dumped onto the sand at the foot of the wave. One day someone offered me a surfboard to use so I paddled out through the big waves on it and once behind the surf line decided that the waves were too big. I pushed the board into the waves and left it to its own devices while I swam back to shore. That was my first and last attempt at board surfing. It's a pity that there were no boogie boards in those days. Moving on around the coast we get to the Inner and Outer Kom surfing spots. The Outer Kom has large waves which come rolling into the bay over a reef and form the waves of the inner Kom. If you should fall off at the Outer Kom you have a long swim to get back to shore and surfers often lose their boards at this spot. The Inner Kom has its own dangers. It is a ride to the left which only works at high tide. The shoreline is all rocks and 10 to 15 metres off the rocks are kelp beds. Fall off here and you're on the rocks and are bound to lose some skin. A friend of mine was surfing at this spot one day while the tide was pushing. The kelp was still above the water when he caught a wave. Unfortunately for him his skeg caught in the kelp and he did a running dive off the front of his board as it stopped dead. It was really funny, but could have been extremely dangerous had he been closer to shore. There are many more excellent spots along the west coast of the Peninsula, places like Misty Cliffs, Scarborough to name but a few. Misty Cliffs is a good spot for big waves and a long swim if you should lose your board.These days when the south east wind is pumping you will find hundreds of windsurfers and kiteboarders doing their thing on the waves. Between July and November the surfers have to watch out for whales as many of them enter ther bay to mate and give birth to their young. The False Bay coastline has warmer water and some good surfing spots. The best known ones are at Fish Hoek and Muizenberg corner where one can have a long ride in when the surf is good. Unfortunately in the summer months this spot is normally blown out by the south east wind. Of course when the wind drops or changes around to the north this is one of the better places to surf. One problem along this coastline are the Great White sharks. A number of attacks have taken place so surfers have to be very careful in the waves here. A shark spotter has been employed to warn surfers of any dangers. To surf at Muizenberg means getting up very early in the morning to beat the wind.Once the wind comes up there will be no surf. Along the False bay coastline between Muizenberg and Somerset West are a number of good spots for surfing. Places like Nine Miles, Cemetary and Monwabisi. I however will not recommend going to them by yourself for a number of reasons. The beaches are close to some of the unsavoury areas of Cape Town and are not always safe. Just off the coastline is Seal Island which is a well known spot to see Great White Sharks as they are attracted there by the seals which live on the island. A good thing about Caqpe Town is that there is nearly always surf available, you might just have to drive a bit to find it. With today's petrol prices it might just cost you a couple of bucks to find a wave or two.